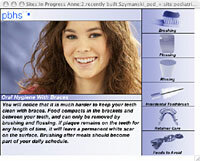 Floss nightly and use your proxy brush after brushing to remove the plaque missed by toothbrushing. Orthodontic floss picks can be used by placing the thin side against your teeth and push it under the wire. Use your fluoride rinse twice a day after brushing and flossing.